In this ever-changing age of social media, we’re getting bored more easily, and want to digest information as quickly as possible. And so, the social media manager’s job gets harder with every new update and trend. That’s why we’ve compiled the ultimate guide to producing epic Instagram content for your business or clients, and importantly, how it can help growth and drive sales! Before we get to the exciting bit about making visually awesome Instagram content, first, we need to talk about the purpose of it. Everyone likes a well-crafted post, but what is the objective behind it? If your marketing team spend hours a week creating Instagram content that gets loads of likes but drives no conversions, it might not be worth their time and resources. When beginning the daunting task of writing a content marketing strategy, think about what the ideal business outcomes would be from the photos, videos, Stories and ads you’re planning to post. Often people come up with cool ideas for Instagram content, but struggle to apply a reason for them. They become attached to the idea and end up going ahead with it, hoping their audience find it as cool as they do (sound familiar?). So the way I like to think about this process is by starting with why rather than what. Why are they using Instagram for their business? Therefore, what content should they posting? Be consistent, and always remember quality over quantity! Once you decide how often to post, you can save time by scheduling to a content calendar like the one below. 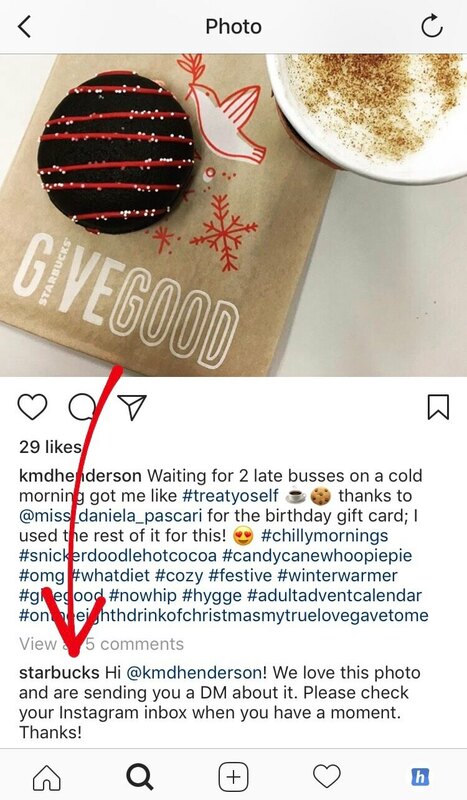 What hashtags do you want and not want included in every post? Do you sign off personally or always stay in the brand’s voice? Get all of the above in a communal doc shared with members of the team who have access to the account! Once this is made, everyone will be able to put out Instagram content confidently and it will save a lot of back and forth. Now you’re feeling a little more organised, let’s get on to the good stuff. Not only is consistency important with how often you’re posting, but also what you’re posting. 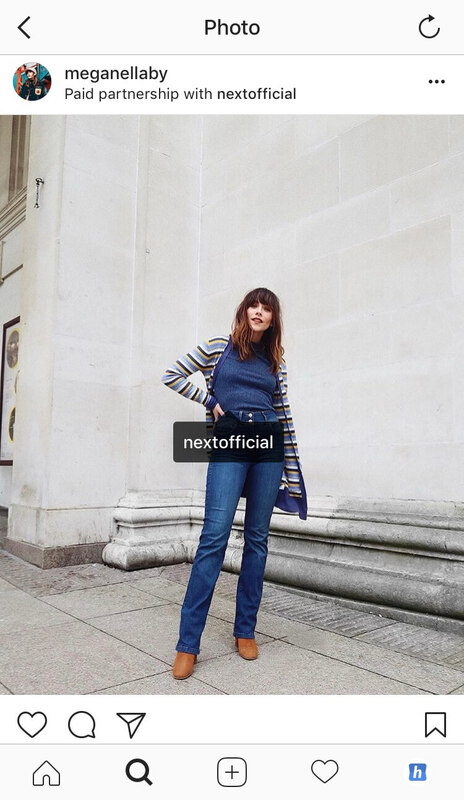 Brand Instagram accounts are acting more and more like websites rather than just a place to post photos, so how can you keep people on your page? Start with finding your style and become recognisable! 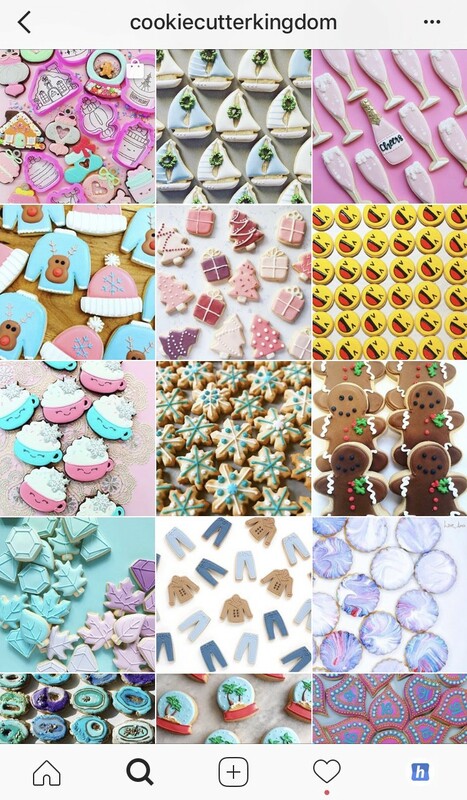 A great way to create an attractive Instagram theme is to use a consistent colour pallet throughout your feed! This might be through only choosing certain photos, or editing them using the same filter. 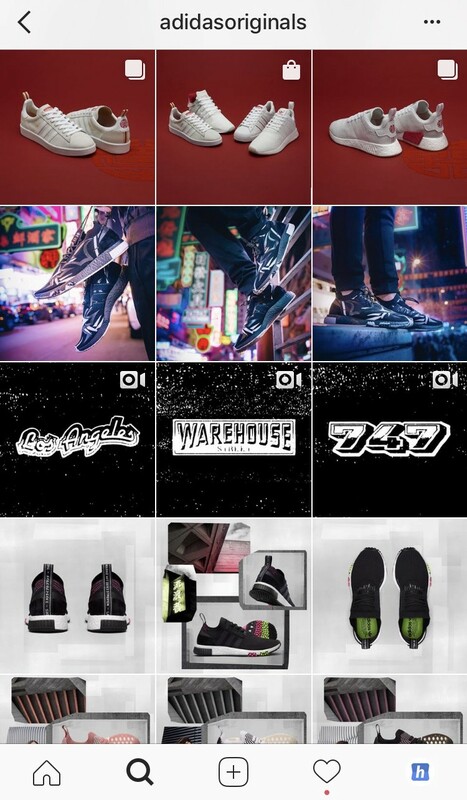 Or you could think of your feed as a visual gallery, with each image linking to the one beside/above/below it. When a new user visits your page, you want them to be impressed with the overall aesthetic in order to keep them scrolling and exploring individual posts. You may have great captions on all your photos, but if nobody is clicking that far, they won’t help convert new users (remember your objectives!). 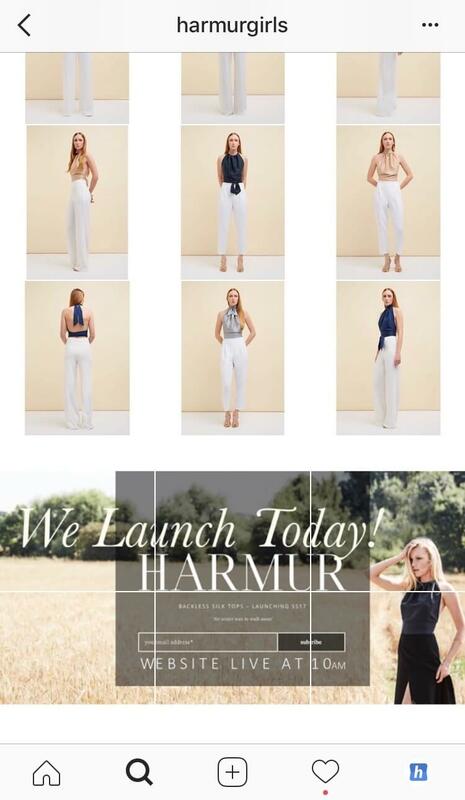 Or you could follow Zara‘s suit and consistently use white borders for all Instagram content. These borders might be uniform in size and shape, or alternate depending on the content. There’s loads of photo editing apps that can add borders for you, notably Afterlight and Whitagram. 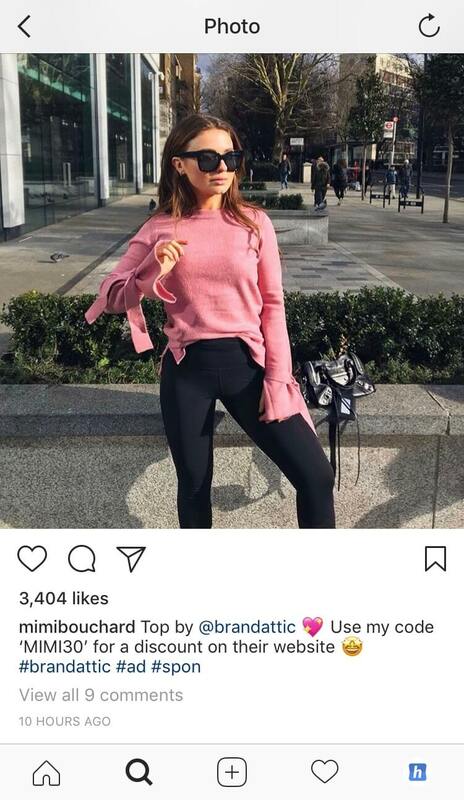 This technique breaks the feed up and gives the impression of a catalogue, which is perfect for a clothing brand’s profile! A checkerboard theme is another effective way to separate images and catch attention. 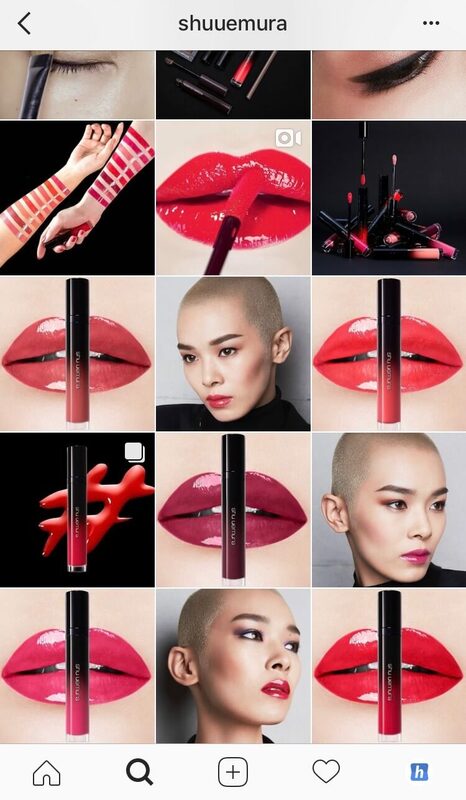 The alternate tiles could be of different products, or taken from another viewpoint, like Shu Uemura does on their profile. 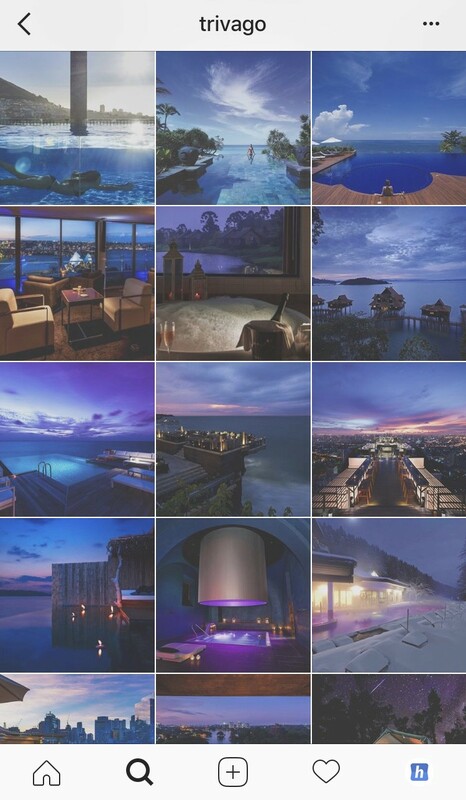 This grid style also works nicely with text posts, such as quotes or facts, to break up the photos and videos. Another option is splitting your image into 3, 6 or 9 parts and posting them in order to make the full image appear on your whole profile. This looks visually impressive (so long as all the parts are high resolution), however, due to Instagram’s home feed not being chronological, the different parts of the photo will appear as people are scrolling and not make a lot of sense on their own. I’d avoid doing your whole profile this way as a result, but it works nicely to make an announcement or unveil a new product, like Harmur did in the example below. 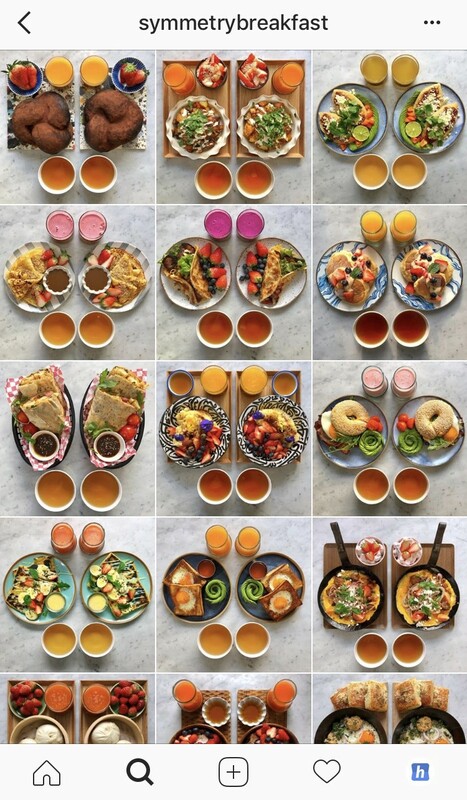 If you’re going to do tiled posts like this, in your caption make sure to point people in the direction of your profile to see the whole image – this can be a great way of getting people to click through to your account! Pulling off a themed Instagram account like the ones above requires consistency and organisation, which is why creating your brand guidelines in advance is really beneficial! The extra effort it may require will be worth the wow-factor that someone will get when they find your business’ page. 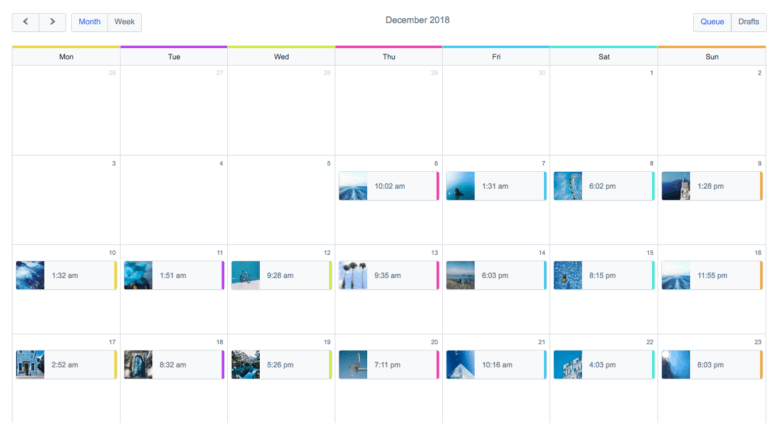 Use a grid planner like the one on Hopper HQ to see what your scheduled posts will look like on your Instagram feed once they’re published! 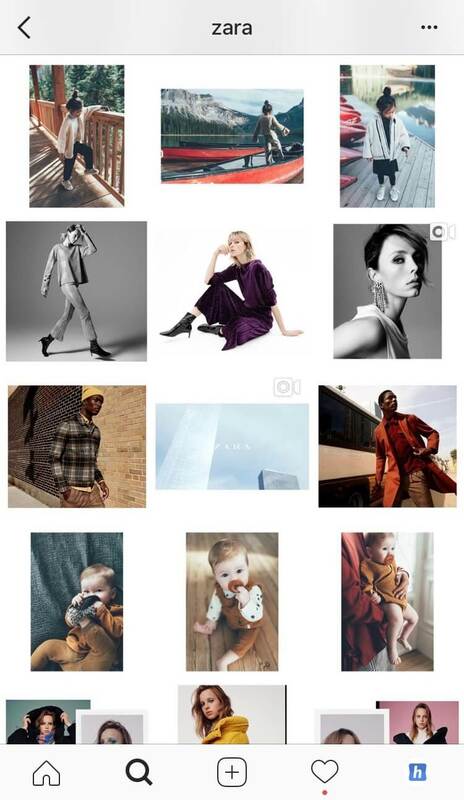 This way you can play around in advance to get the perfect grid theme and feed aesthetic! “But what should we actually be posting? !” I hear you cry. If your product or service is photographable, then that’s an obvious place to start (independent bakery example). However, if you sell SaaS or run a remote business, you’ll have to think outside the box. It might be that you use your business Instagram to share useful information in the form of text posts, or to document your company lifestyle with behind-the-scenes insights. Think about your target audience and what matters to them . Don’t just guess, go and find out by speaking to customers so you can cater your Instagram content effectively! Not everyone who manages an Instagram account is a photography expert. But with the amount of accessible tools out there, it’s easy to pretend to be! There are also some quality photo editing services available online that can take your images to the next level. A simple way to make your shots look visually better for Instagram is thinking about composition. We’ve all been guilty of awkwardly raising your arms over your cappuccino in order to get that insta-worthy flat lay shot. Despite the eye rolls or embarrassment of your friends, you can’t deny it’s a winning angle. But these kinds of compositional photos don’t have to be restricted to the food industry. A composition is simply the way that something is made up, so think how your business could incorporate your product, service or brand into a creative photo. It also doesn’t have to be man-made; utilising natural frames in your photography, such as windows, creates the same aesthetic effect as arranging items on your desk into a neat pattern for an overhead photo. Your customers can be your best marketers. Photos other people have posted on Instagram of your product, establishment or service make really valuable content. Keep an eye on your mentions and tags for any great snaps that would fit with your feed. Remember to ask permission to repost another user’s image — this could be through a friendly comment, a direct message, or a link to T&Cs which big companies like Airbnb have begun using. 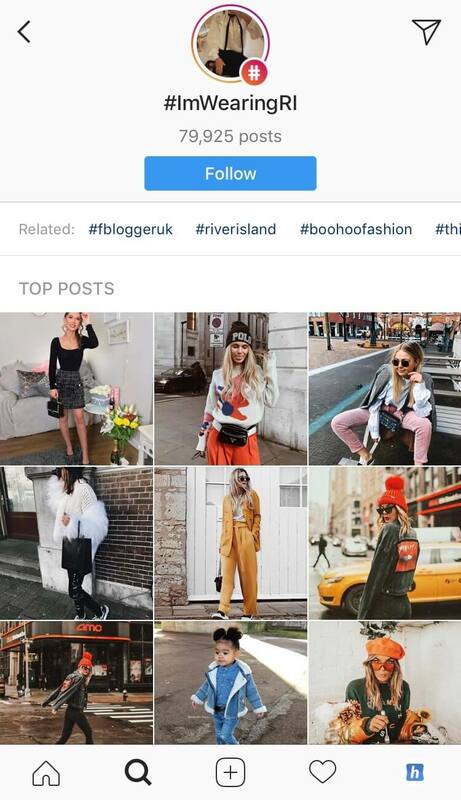 Another great way to generate and find customer Instagram content is by creating a brand hashtag, such as River Island’s #ImWearingRI. You can include this in your bio with a call to action for followers to ‘tag to be featured’ to easily keep track of UGC. However, this works best once you already have a bit of momentum. If you’re just getting started with your brand Instagram, it’s a great thing to have in place, but don’t expect a lot of results straight away! You can also find user-generated content libraries online, such as Scop.io, which help you find high-quality images that are relevant to your audience! If you have a decent budget allocated to your Instagram content, you could also use influencer marketing. Instagram influencers are people with a highly engaged group of followers, who take notice of what they use and recommend. For example, if you follow a travel blogger for their great photos and funny captions, and they post about the best airplane pillow ever, you’re more inclined to remember the brand because you like and trust them. It’s good logic, but more and more influencers are finding it dishonest to authentically recommend a product they’re being paid to post about. You may have seen the following hashtags on product posts: ‘#ad’, ‘#spon’, ‘#paid’ and so on, which let followers know it has been funded by a brand. An update last year also allowed influencers to tag their posts as ‘Paid Partnerships’ with brands. Despite this, influencer marketing is still very effective. The space has grown rapidly in the past couple of years, and as a result, these kinds of campaigns can cost a fair bit. If you have a smaller budget, it would be worth looking for micro influencers to promote your brand. These are people with less followers (1,000 – 10,000) but who have really good engagement on their posts. This percentage could be far higher on a smaller account than somebody with 100,000 followers, and it will cost a lot less! Reach out to them directly, or go through an influencer agency. As I said at the beginning, we want to absorb Instagram content in the quickest, most visual way possible, so it’s no wonder the addictive thumb tapping of Instagram Stories has taken over so much of our time on the app. 400 million people use Stories every day. It is therefore a great place to market your business in a fun and approachable way. Unfortunately, the ‘swipe up to see link’ feature is restricted to business accounts with 10,000 followers or more, so if you fall below that you’ll have to think of more creative way to get people to convert. Due to the temporary nature of Stories (24 hours), it’s possible to be more flexible with what you publish. It could be an outlet for more personal snaps and videos of your business, or a great place to offer daily deals and competitions. 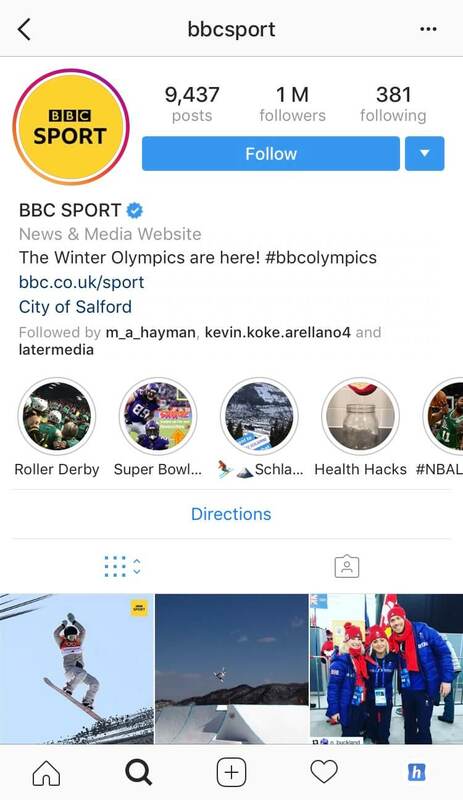 Instagram has made it even easier to do this by adding a text-only Story option, so you can share information quickly and easily without having to worry about a background image or video to post with it. 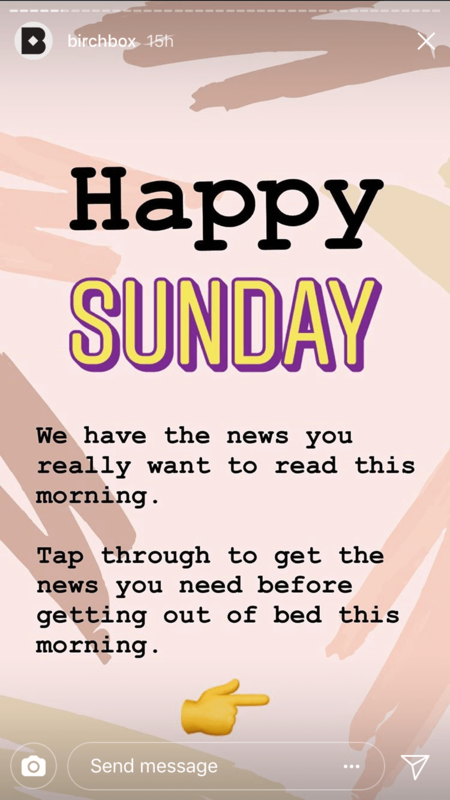 Cosmetics company Birch Box utilise Stories well – offering their followers news and tips in a really digestible way. Take your time thinking about how you can apply the points in this blog to your own Instagram content, and do some research! Find a competitor that’s excelling at digital marketing and assess the kind of Instagram content they post. Also see how they engage with people online, and importantly, what their audience is asking for, as they will be the same people you’re hoping to reach. Hopper HQ is a social media management and scheduling tool built to save social media teams time so they can get back to the fun stuff. Start your 14-day trial today!